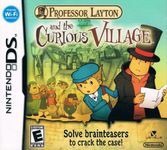 "Professor Layton and the Curious Village (レイトン教授と不思議な町 Reiton-kyōju to Fushigi na Machi) is a puzzle adventure video game developed and published by Level 5 in Japan originally, and later by Nintendo in North America, Australia, and Europe for the Nintendo DS handheld video game console. It is the first installment in the Professor Layton series, and was followed by Professor Layton and the Diabolical Box and Layton-kyōju to Saigo no Jikan Ryokō. It contains 135 brain teasers for the player to solve as the player controls Professor Layton and his young assistant Luke." Source: Wikipedia, "Professor_Layton_and_the_Curious_Village," available under the CC-BY-SA License.